I picked up this prequel to three series of mysteries published by Henery Press. I am familiar with the novels by Gigi Pandian and Diane Vallere but had not read any books by Kendel Lynn. 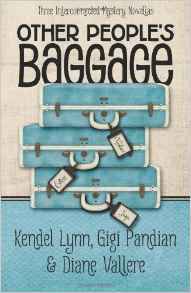 In this set of three short stories, there is a mix-up of three pieces of luggage. What is interesting but perhaps a little too ingenious is that the luggage is vintage in make and style and all three individuals have the same bag. It might have worked better if the luggage had been more nondescript as I questioned how and why such an unusual bag would be owned by three individuals who crossed flight paths. This is a really lovely storybook collection based on all seven books in the Chronicles of Narnia by C.S. Lewis. Those include: The Magician’s Nephew, The Lion, the Witch and the Wardrobe, The Horse and His Boy, Prince Caspian, The Voyage of the Dawn Treader, The Silver Chair, and The Last Battle. As the coloring book is slightly longer than average size and there are seven books covered, each is only touched on lightly. The coloring book can be used as an fun addition while you are reading the stories but it does not replace them. The designs are based on the original artwork by Pauline Baynes from the books written and published in the 1950’s. In some cases, the artwork has been turned into what I call wallpaper style designs with repeated patterns. The designs include considerably more black in shading than usual for coloring books. That is because the original artwork was just that artwork and not coloring designs. I’ve found that utilizing the black as shading is what works best for me with this type of design. I’ve run across it before when original artwork has been presented in this format. On a personal note, the designs bring back memories from my own life. I was a big fan of these books as a child and I would read them over and over again. Once I had children, I would read books to them before bedtime each night and this was a favorite, especially of my late son. He also would read the books over and over again on his own. I am now looking forward to reading them to my grandchildren and I will now also have a book of designs that I have colored to go along with them. I will admit that coloring these designs is a bittersweet experience as I spend as much time thinking of my son as I do in coloring. This is what I found as I colored in this book and tested the paper with my coloring medium. I’ll include a list of my coloring medium, which I use for tests and for coloring, in the comments section below. Water-based markers, gel pens, and India ink pens do not bleed through the page. Colored pencils worked well with the paper. I was able to get good color with multiple layers of the same shade. I was also able to layer multiple colors and blend well using a pencil style blending stick. Both oil and wax based pencils worked well. I own both of Steve McDonald’s first two coloring books and have enjoyed coloring in them. I immediately pre-ordered Fantastic Collections as soon as I saw it was available. The groupings of collections are quite interesting. Some things, such as oil cans, toy horses, locks, and even typewriters are familiar to me. Others are definitely new, such as Japanese cleaning supplies and chainsaws. Most of the designs are presented straight-forward but a few are also interpreted into mandala style format and those become beautiful abstract designs that will be a lot of fun to color. This is what I found while coloring in this book and testing the paper with my coloring medium. I will provide a list of the coloring medium I used for tests and which I use for coloring as well. You will find the list in the comments section below. Alcohol-based markers bleed through page. Using these will ruin the design on the back of the page. Water-based markers, gel pens, and India ink artist pens do not bleed through or leave color shadows on back on page. Gel pens required additional drying time. Coloring pencils work well with this paper. I used both oil and wax based pencils for good pigment, layering multiple colors and blending using a pencil style blending stick. Attached to this review will be a silent flip-through of the entire coloring book so you can make an informed decision as to whether or not it will work for you. I will also include a few sample photos of designs pages from the book as well. I reviewed the UK version of this book here on Amazon in May of this year. At the end of this review, I will discuss the differences between the two versions. The video and photos on this review will be of the US version only, except for the one which I will show comparing the two versions paper color. Once again, rather than discuss how this coloring book is like or different from TV series or to compare any of the Dr. Who actors and casts, I will discuss only how I feel about it as an adult coloring book. The episodes included are from 1964 through 2015, so the range of Dr. Who’s represented is good. This time the designs focus on Dr. Who in various time periods including Vikings, ancient Egypt, the Battle of Hastings, with Winston Churchill and even with Shakespeare among many others. The designs are well drawn with clean black lines though it is easy to see that these designs are hand-drawn for the most part as the lines are not perfectly straight. Some designs are fairly open and easy to color while others are more intricate and will be a little more challenging but still a lot of fun. The book is well made once again. The designs are printed on one side of deep cream colored non-perforated paper. On the back of each page is a thumbnail version of the design along with a quote that is applicable to the design, the name of the episode and the year it was filmed and, in some cases, which Dr. Who it pertains to. The cover can be colored as well and has deep red foil touches which enhance it. The publisher once again missed an opportunity by not providing designs on the inside of the fold-out, attached cover; however, there are two flaps you can color if you wish where the printing is white on red background. The binding is sewn rather than glued, so removing pages is a matter of snipping threads. A good number of designs merge into the binding area so snipping threads may be the way to go if you decide to remove pages. Paper is heavyweight, deep cream color, very smooth, and non-perforated. Alcohol-based markers bleed through the page. I recommend a blotter page be used under your working page to keep the page below free of seeping ink. Water-based markers bled through in the tiniest of spots except for Tombows brush end markers which did not bleed through at all. I recommend a blotter page be used under your working page to keep the page below free of seeping ink. India ink markers left shadows on the back of the page. Gel pens did not bleed through but needed extra drying time. My colored pencils were a little mixed. I was able to get good color and layer the same color and mixed colors well with both oil and wax based pencils. I had a little trouble with blending (using a pencil style blender stick.) The color smeared a tiny bit more than I am used to and that is probably because the paper is very smooth. The pencil did blend but not as well as it did with the British release of this book. My comparison of the US and UK version is fairly short. They weighed the same and are the same size. They contain the same designs. The differences are slight. The cover of the US version is slightly lighter with slightly darker red foil. The US paper is a much deeper cream tone. Both bindings are sewn but are sewn together on different pages. The biggest differences is in the feel of the paper. The US version paper is much smoother. I am happy with both but if I planned on doing a lot of blending of pencil or if I wanted lighter paper, I would opt for the UK version. Otherwise, I like both versions. I really enjoy coloring Jason Hamilton’s designs. From his first coloring book (Cats and Quilts) to this, Mermaid Fantasy, I’ve found his artwork to be beautiful and fun to color. I came across Mr. Hamilton’s mermaid designs in his recent contribution to Adult Coloring Book Treasury 2 and was in high hopes that he would soon release a mermaid book. Just a week or so later, here it is. Along with a video and other sample photos from this book, I will include the mermaid that I colored for Treasury 2. In this book, the focus of the designs is on mermaids. There is a merman and even a human but, for the most part, there are mermaids. There are even a few mermaids with their children. The designs have a nice level of detail. There is plenty of room for shading or adding your own details, if you wish. The elements on the full size pages are a good size and are not difficult to color with any type of coloring medium that I use. The smaller (4 x 6 inch) versions may require ultra-fine nibs or sharp pencil tips but that is to be expected with a design that has been sized down. This is what I experienced when I was coloring in this book and testing the paper with my coloring medium. In the comments section below, I will list the coloring medium I used for testing this book and which I usually use for coloring my projects. Gel pens and India ink pens leave colorful shadows on the back of the page. India ink can bleed through if it is applied heavily or in multiple layers. Colored Pencils work well with this slightly rough paper. Both oil and wax pencils provide good pigment with multiple layers, layer multiple colors well and blend well using a pencil style blending stick. Hard lead pencils can dent through to the back of the page. I use a blotter of card stock under my working page. Several sheets of heavier weight paper work well, too. This keeps seeping ink and dents from messing up the pages below. This is my third coloring book by doodle artist Lei Melendres. I have enjoyed his unusual look at the world both in Doodle Fusion and more recently in Doodle Worlds. In this new book, Mr. Melendres presents a narrative of a doodle world rather than a compilation of doodle designs. In this story, we follow the life of a young doodle creature as it chases after its wind-swept away balloon. There are many adventures to be had, some of which are fun and some of which are challenging. They are all a lot of fun to color. The designs in this book are quite detailed. Having said that, they are not overly intricate and do not contain a lot of tiny spots. There is simply a lot of detail to color. There are also two double-sided pages at the back of the book for use in determining color palettes. I really appreciate the palette pages as it allows me to test my medium and colors on the exact same paper my projects are on. This is what I experienced while coloring in this book and testing the paper with my coloring medium. In the comments section below, I will include a list of the coloring medium I use for my tests and which I generally use for coloring my projects. I can get the book fairly flat for coloring but I did have to crease or break the spine to do so. Water-based markers leave colorful shadows and tiny spots that bleed through on the back of the page. Gel pens and India ink pens leave shadows on the page of the page. Colored pencils work well with this paper. Both oil and wax based pencils can lay down good color, layer multiple colors well and blend well using a pencil style blending stick. Hard lead pencils can dent through to the back of the page. I suggest either removing project pages from the book or using a blotter page behind your working page. I like card stock but a couple of sheets of heavyweight paper work as well. This is my second Cats coloring book by Margaret Gates Root. She has a beautiful knack for coloring cats in poses that bring my own cats firmly to mind. My cats have all passed now but I really enjoy coloring all sorts of cat designs and especially those that make me think of them. What is fun and special about these kitties is that they are inspired by some interesting sources. They are based on fables, rhymes, fairy tales, and more. As Ms. Root suggests on the back of the book, you can either look to see the inspiration or not peek and try to guess as you go along. I couldn’t help myself I had to peek. The designs are detailed but without itsy bitsy tiny details. I will enjoy coloring in this book with all of my various medium provided I take the proper precautions to keep the rest of the book in good condition. The 25 designs are presented in full page, horizontal format but are also provided in slightly larger than thumbnail format at the back of the book where the artist explains the source of her inspiration. Those smaller designs can also be colored but you may need ultra-fine nibs and/or sharp pointed pencils to finish them. This is what I experienced while coloring in this book and testing the paper with my coloring medium. I will provide a list of the coloring medium I used for testing and which I use for most of my projects. You can find that information in the comments section below. Paper is thin, white, slightly rough and non-perforated. Designs do not merge into the binding area and have a frame line around the outer edge of the design. Gel pens and India ink pens leave colorful shadows on the back of the page. India ink can bleed through if you layer it or use it heavily. Colored pencils work well with this paper. Wax and oil-based pencils provide good pigment and I can layer and blend well with both. Hard lead pencils (like Verithins) can leave dents on the back of the page. Because of the bleed through and dents, I always use card stock as a blotter to keep ink and hard lead pencils from marring through the page to the designs below. I own a couple of Helen Elliston’s earliest coloring books and decided to pick up her most recent based on the cute cover. Her designs are as cute as ever but I was surprised to see that the book was in the smaller format she used for her mandalas coloring books. It works well and makes the book a little easier to carry around. What I was happy to see was that the designs are included all on one page. In her earliest books, some of the designs spread slightly across two pages and I much prefer the way the book is put together now. I also like that the designs stop well before the binding area in this book as well. The designs are a really eclectic mix of what seems to be whatever hit the artist’s fancy that day. I think that is great as it lets me see a little into the world that she sees as well. One of my favorites is the people climbing all over various books. I also chose it for my first project in this book. This is what I found as I colored in this book and tested my various coloring medium on the paper. I will include, in the comments section below, a list of the coloring medium I used to test this book and which I generally use for completing my projects. Paper is thin, white, slightly rough and non-perforated. It is typical of anything published through CreateSpace. Gel pens and India Ink artist pens create colorful shadows on the back of the page. India ink pens can spot through if multiple layers are applied. Colored pencils work well with this paper. I can use either wax or oil based pencils and get good pigment (with multiple layers of the same color), layer multiple colors well and blend well using a pencils style blender stick. My hard lead pencils, such as Verithins, can cause dents through to the back of the page. I use a piece of card stock or a couple of pieces of heavy weight paper as a blotter when coloring in this book. It keeps ink from seeping through or dents from marring the pages below my project page. This is a beautifully hand-drawn set of designs which feature 20 different endangered species. The artist, Casey Gilmore, is both a biologist and an artist and it shows in the high level of detail found in most of these designs. Because of the shading in the designs, I used some of the skills I have learned for grayscale coloring; however, from my point of view this is a coloring book and not a grayscale coloring book. The designs are all printed on the right hand side of the page. Opposite each design, on the left hand side of the page, is information about the animal, including name, scientific name, habitat, diet, coloration, uniqueness, and conservation. It makes for very interesting reading. Also, for those who want to color their designs to be more life-like, it is nice to understand the coloration. I really appreciate that each design has its own color palette page following the design page which can be used to test colors before committing to them in the design. It can also be used as a blotter page but if you are using alcohol-based markers, I suggest adding additional paper to keep ink from seeping through. In addition to being a very well done set of designs, the book is endorsed by the Wildlife Act Focused Conservation Act. While I did not find reference to this in the book, the product blurb mentions that 1% of all proceeds from the book go to Wildlife Act a conservation organization in South Africa. This is what I experienced while coloring in this book and testing the paper with my various coloring medium. In the comments section below, I will list the coloring medium I used for testing this book and which I usually use for coloring my projects. Designs are printed on one side of the page while information about animals are printed on the other side of page. Color Palette pages are provided for each design and can be used as a blotter page as well. I prefer to add my own blotter page of heavier weight paper or card stock. Paper is thin, white, slightly rough (with good tooth), and non-perforated. Water-based markers, except for Tombow brush end, can spot through on this paper. Gel pens and India ink pens do not bleed through though India ink can bleed through if you apply multiple coats of ink. Colored pencils work well with this paper. I was able to get good pigment with repeated layers of the same color and to layer multiple colors and blend well (using a pencil style blending stick.) I had good results with both oil and wax based pencils. Hard lead pencils can dent through to the back of the page. This is a really lovely Christian-based monthly calendar. The artwork is licensed from Shutterstock and each of the designs (except December) incorporates a Bible verse and cite from either the Old or New Testament. December quotes the words of a beautiful Christmas hymn Oh come let us adore him! rather than a verse. The calendar does not cite which translation(s) it uses. The monthly calendar pages are bound by a top spiral and the purple base unfolds to stand the calendar in an upright position. It is easy to fold it back up to flat for coloring purposes. The cover and the base are glossy. The cover is card stock as are the monthly designs. The base is a heavier weight cardboard. My first project in the calendar, January 2017, I finished using wax-based colored pencils. The design takes up the majority of the page with a smaller calendar section as part of the page. I really appreciated that the design matched to the verse but in a cute way. That I could focus on the Scripture as I colored made the project a special time for me. This is what I discovered as I colored in this calendar and tested my coloring medium on the paper. I will include, in the comments section below, a list of the coloring medium I use for testing and for most of my coloring projects as well. Colored pencils work well. I got a good color, layering, and blending with both oil and wax-based pencils.